It took me awhile to figure out what to think about the sound of this system. I kept thinking that there was something hauntingly familiar about the sound. It was very even top to bottom, even the dynamics were even-handed top to bottom. There was a lot of detail [midi-detail and macro-detail, micro-details were not glaringly absent, but they were weaker than what I would call natural]. Tone was good solid-state-ish tone. Harmonic resolution was typical for solid-state [aka not all that good, but it *is* solid-state]. There was good image stability and good separation – although something was happening during complex passages that seemed unnatural – like one channel was happening ‘before’ the other channel or something – that prevented that lovely effect of allowing one to hear every instrument as a separate entity when everyone is playing at once. That this is a realization of the way I thought [and many still think] a stereo system should sound when I was a young geek. I was way into math and physics and the engineering sciences. I would have wanted a system that had as source material something as close to the master tapes as possible and recorded it in as high a resolution as was possible. Then I would have used a dedicated computer music server to deliver it to a solid state amp of low distortion, probably after passing it through a room correction device. Finally this system would have speakers that measured very, very well. This is what I saw in this room. Well, now I am an old geek. This is not a derogatory perspective. And this system is not like TaCT which MANIPULATES the signal in the pursuit of some goal mathematically arrived at. The system in the Magico room tries to PRESERVE the signal by methods mathematically arrived at. Many systems mix and match various quantities of these 4 audiophile food groups. I think the Magico system in the room at RMAF did the COOL GADGETS thing and that no one else is really doing it front-to-back like this. Many rooms do something like this – notably the Kimber room uses similar high-quality source material, but everyone mucks it up somewhere in the chain. See, this system SOUNDED like a Cool Gadget system, and that makes it a grown-up BOY’S TOY. I think that if a system like this was marketed this way – that it might be quite successful with real people [you know who I mean. Those non-audiophiles that seem to appear out of the woodwork at grocery stores and can be seen walking down the street during the daylight hours]. That said, this system would be an example of what is commonly called a ‘soulless’ system. This was the primary comment people had about this room. 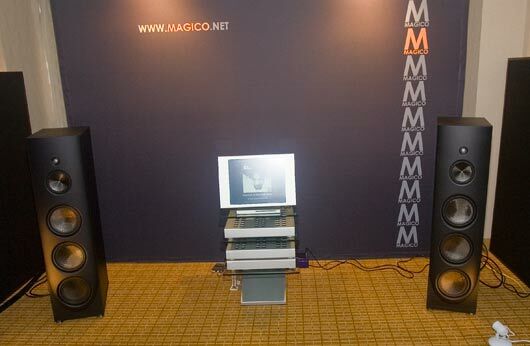 The Magico room system degrades into an impressive BOY’S TOY [mostly because COOL GADGET systems do not primarily connect one with the music so much as connecting one with the awesome world of technology]. I am personally interested in systems as DRUGS. I want to get high on my music. I want to experience new and intensely aesthetic perspectives on life and living. I want my system to be so good that I have no choice but to be forcibly projected into another dimension better than this one [:-) seriously, it is instead a more accurate and timeless view of the true reality of this dimension – that is too often obscured by the ever present noise of people yelling at us wanting to convince us of something. I SAID ‘seriously’… :-)]. I am too busy [to have the time to listen for hours before I get a buzz] and too worried about the world going to hell [the music has to be very powerful in order to work at all] and too cynical [the musical goodness has to be so good and so subtle and encompassing that it can sneak up on the nasty ole suspicious ‘nothing can brighten my day’ me]. And at the low end, I want my systems to smoothly degrade into being PRACTICAL [i.e. built on a PRACTICAL foundation] . There is a point here I want to make. It is cool wanting and buying a COOL GADGET system. No question about it. Maybe someone just wants to have fun, or expands their minds in the old fashioned way 🙂 or whatever. I just think it is important for people to recognize that systems have different purposes – and that lumping them all together is very misleading and confusing. That the more we identify and categorize [yes, I know that categorization leads to closed-mindedness – but, seriously, things are just too chaotic] the better it will be for people who want to enter this hobby. You know, just like cars are divided into ‘sports cars’ and ‘luxury cars’ and ‘SUV’s?. Mike – You nailed it. To quote you: “I want to get high on my music.” Takes me back to late night group gatherings in the dark on the floor…group smoking and listening sessions. (It was the 60’s) Moody Blues In Search of the Lost Chord. I lay on the carpeted living room,. the only non smoker.. surrounded by stoners “enjoying” the music and their “high”. I, totally into the music, not analytically, ignoring occasional tics and pops, getting up to turn the records over, but so into the music as it seemed to surround us all in the room (Marantz 7C/8B, Thorens TD 124/SME, Shure V15, Altec Voice of the Theaters A7-500 – it was the 60’s! ), being AWAKE [See H.D. Thoreau’s Walden “What I Lived For” – being awake to the “undulations of celestial music”] I listened to the same music comfortable in knowing I had a top system of the time, felt like it was “live” and I was in/at the performance. Of course I took an occasional toke (Soon to be legal here in CA???) to prove I was human and not working as a narc (My friends were paranoic and VERY HUNGRY) but really i was HIGH ON THE MUSIC. Your and Neli’s taste and demo rooms clearly reveal this pursuit of the etherial. By late Saturday, your system was beginning to bloom, to show its true character, even as you wandered from room to room looking for that same effect. I’m awaiting your day by day, hour by hour narrative of the blooming. It being my first attendance at such an event I was impressed with and overwhelmed by the range of systems and gear. I share your assessment that only a few stood out, overcoming challenges of room size, logistics, practicality, business concerns attendees tastes and interests. Still it was great to see such myriad gear across price ranges, quality, and user tastes and to share in the progressive awakening to the promise of the ongoing marriages and divorces of recorded music and continuously improving playback technologies. I’m also awaiting more of your astute comments on the systems and rooms we all visited. Keep up the good work. Yeah. Moody Blues. Kind of hits the nail on the head of that whole scene for me too. First, you should actually read the review. Second, I went to a lot of trouble describing this system because it was to a large degree the only interesting system at the show. If you care to go through our Audiophiles Guide to the Galaxy, you will see that we try to describe and classify every kind of component and system – not just those that I personally, 1 of 6 Billion people on the planet, prefer. One of the things we struggle with there and here on the blog is how to classify all kinds of audiophile preferences. I cannot see how anyone, who does not already have a ‘chip on their shoulder’ [i.e. is insecure and lacks confidence for all you who are not familiar with American slang] could interpret this as vindictive. 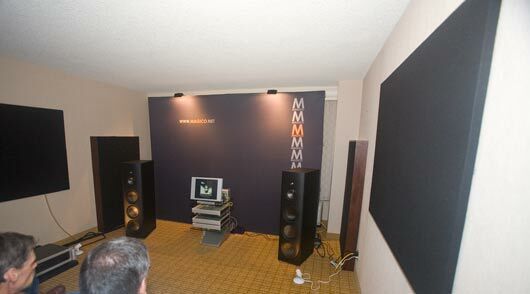 It is actually a very positive review [in-as-much as it says nothing about Magico except that it measures very well] and for dealers who can use their brain they can make themselves a lot of money [pairing high res speakers with high res wizz bang technology in a turnkey package] if they are so inclined. This has NOTHING to do with Magico or Spectral but the specific design of that system in that room and these kinds of systems in general and the people who like them. Obviously your dealer prefers the shallow, vanilla, over-hyped pablum by unethical reviewers that is force fed to unwitting customers to rush them into buying the current product d’jour. Why Magico, and in the past YG Acoustics [who we are finally on friendly terms with] get their knickers in a twist and start posting wacko posts like yours on this blog because someone [in this case me] takes the time and effort to write about how their rooms ACTUALLY SOUND is because they, as was explained to me, do not understand America and think that anything that is not 100% glowing is a threat to their brand. They do not realize, at first, that HONEST ASSESSMENTS [esp. as opposed to marketing fodder] are valued by many people, it helps them make wise buying decisions that they will not regret [and people with buyers remorse would indeed threaten their brand. Duh]. Lexus is a boring to drive, reliable luxury car. BMW is a fun to drive car expensive for what you get. OMG! I’ve destroyed 2 more brands! To be perfectly clear: we have never “applied” or otherwise inquired with Alon or anyone else at Magico regarding becoming a Magico dealer. So there has never been a dealer application or any other inquiry to be “denied”. [Not sure what your point is, Will, except to continue the empty over-hyping. Seriously, this blog is about examining in detail how things sound and how and in what ways these things both succeed and fail at reproducing music. We will start to delete these faux stupid comments if they continue in this fashion. I do not think that the entire chain has to be ‘brand new technology’, esp. since a large percentage of music is/has been played on old fashioned instruments onto old fashioned tape. A large majority of readers of this blog are not American. We can wish that more Americans were into high end audio – but in general we’re an uncivilized bunch :-). I think the person who I quoted’s point about manufacturers not understanding the free and open nature of discourse in the U.S. was largely referring to the fact that this very public demand that every review of every attribute of their product must appear to be the very best that the world has or will ever see is regarded as abnormal and suspicious here in the U.S. and is counterproductive for the manufacturer if their purpose is to sell things here. After various lucid superlatives, you concluded that “something was happening during complex passages that seemed unnatural”. A total contradiction to all you had stated before. Do you care to elaborate how a system can be both “even top to bottom, dynamics were even-handed … lot of detail, micro-details .., good image stability and good separation..” and yet, “one channel was happening ‘before’ the other channel or something”… Sorry, but your comments on sound, in general, have been quite slanted, incoherent and highly inaccurate. Perhaps you should read your reviews as well and not just write them. And maybe not, like I said, your are amusing… BTW, I do not own any real expensive high-end gear, but I have no problem enjoying them at a show. Systems can sound good on simple music and fall apart in many ways on complex music. In fact all systems have trouble with this to a greater or lesser degree – and it is why so many audiophiles and so many exhibitors like to play audiophile music and 3 and 4-piece jazz and simple pop music so very much [in fact – most play nothing else]. Like EVERY SINGLE other sonic attribute – EACH PIECE of the entire system has to be able to handle complexity in order for the system as a whole to handle it. When the system handles it correctly, you can listen to (focus your attention) on each thread of the melody by itself, jump from melody thread to melody thread, instrument to instrument, or sit back and listen to it all unfold. When it doesn’t handle it correctly, it sounds confused and like a mish mash of noise – it draws your attention away from the music and whatever level of convincingness that was going on. Why oh why do so many people attribute the sound of a room to the speakers [and why do speaker manufacturers take so much credit for it]? We had the world famous and very distinctive looking Audio Note Ongaku integrated amps, so in our room they drew some amount of attention away from the speakers. But still, my memory has *about* 40% of the people attributing the sound in our room to the amps, 30% to the speakers, 10% to the CD player, 5% to the cables and only about 15%, correctly, to the whole system [lots of these, surprisingly?, were non-audiophiles] [yes, you CAN pick apart a system’s sound and attribute this or that characteristic to a single piece of gear – but this is hard. And just realize that ‘it takes a system’ to make a single note] [that 40-30-10 ratio is an interesting one. One could say that this is the approx. contribution ratio of each of those components to the overall sound??? Hmmmm…]. I personally do not think it was the speakers in the Magico room that had problems with complex passages. I do not think it was the amp either. It probably wasn’t the source. Although all of these can contribute problems to rendering complex music – this kind of weird phasy behavior is not characteristic of these components [assuming they were wired more or less correctly 🙂 though I just remembered they were talking behind me about a clocking wire unexpectedly just hanging loose and not connected to where it was supposed to be connected – but I did not think anything of it at the time. So maybe it was the source after all. Or maybe not. It was not like they stopped the music and fixed it during the 20 or 25 minutes they had while I was there]. Yes, we enjoy shows for the same reason – we get to hear a lot of stuff that we don’t get to hear at our home/shop. Most of the rooms just go through the motions – but some are interesting and we try to glean as much as possible from these during the all-too-short time of a show. Anyway, all you speaker-centric fan boys and girls out there – no matter how good the speakers are or are not, I swear to you that I could make them sound horrible. No, its not a special talent of mine – though I can be quite good at it at times. You can do it too! It is WAY easier than you might think. In fact, it is so easy most people do it all the time without even trying. But a word of warning – it is much harder if you pay real close attention to all your choices of components and cabling, and how they aid or detract from the kind of system sound you want to listen to. You described Magico sound pretty well. But I wonder how can you bear Kharma. Because I could easily describe Kharma’s sound caracteristics almost same as Magico. Not to be a nit picker… 🙂 but I was describing the sound in the Magico ROOM. The Magico V3(?) speakers driven by the Tenor amp and preamp and Continuum turntable at CES almost 2 years ago sounded different than this. Although the sound at RMAF may indeed be the sound that Magico is ultimately going for [a large majority of their systems have some beefy solid-state amp and some kind of digital server as source (yes, recently with R2R in the background, but…), I would have a hard time pinning down the Magico sound. There are certain commonalities between the speakers – in addition to build quality – but there are key differences make me want to think only about this particular speaker’s sound or that. Kharma, on the other hand, is almost the complete opposite. I am not sure what experiences you have had, and it makes me curious to hear you compare them to Magico [though both have a similar fetish for build quality ;-)]. I brought up Kharma earlier in this thread because I believe Amir has a friend who has the big Kharma Grand Exquisite speakers, and he naturally bases some of his observations on his experiences with these. Kharma definitely has a family sound. How each manufacturer arrives at a family sound seems to me to often be happenstance, based on skill set and technology chosen, but just like Marten goes for the ultimate transducer and Wilson for very high quality impressiveness and Sonus Faber for aesthetic sweetness and Avalon for dynamic sweetness, etc. etc. etc. Kharma goes for high resolution emotion. An extreme oversimplification but useful, I think, in putting things in some kind of order. This point-by-point comparison s not going to be very illuminating though. The point is that Kharma goes for very high resolution in the frequencies where voices and most music subtleties lie. I mean micro-dynamics and detail out the yin yang, as a friend would say. This is where most emotion is communicated (although some primal rhythms are found in the bass – which Kharma is getting quite good at, but not quite Wilsonesque). It is this aspect that they seem to emphasize to the exclusion of other things other speakers do that gives them that family sound. So much so that if any speaker can sound soulful with solid state, it is these [they do, or come very close, and we have often used SS on them. Their drivability profile is very complicated, but they are apparently easier than the Magico, and the Avalon, and seemingly quite similar to Wilson… to kind of pin it down a little]. Tyler/Will – I hope you’ve stuck around for this answer (and especially Mike and Neli’s) and take this all in the good spirit with which it is intended. I find your description of Magico system sound spot on. I consider them one hell of an engineering achievement. Artistic achievement, not so much (except for the excellent V2). Your pithy renditions of the ‘house sound’ of other speaker makers was also entertaining and good food for thought. But I really resonated with your segmentation of system types (‘boy toy,’ etc.). Very nice. At core, do I want a system to impress me or move me? Both, really. In fact, being a geek, both must be present for my enjoyment. But at core – MOVE ME! Reveal the passion, tenderness, rage of the music. Thanks for your quick reply, and sorry for my delay to answer! At first I must explain which model of Kharma and how I listened to. The system is Kharma Grand Exquisite + Vitus SS-101 + dCS Scarllati. Room acoustics is not great and I think it needs some treatment in bass but for mid and highs its acceptable. You know I’m not a professional reviewer and English is not my first language. So don’t expect me write about my experiences very fluently. I couldn’t explain Kharma sound better as I’ve heard same Vitus amp with Wilson MAXX. It was far more acceptable sound, albeit with less resolution. Well I could just added to soulless “a lot of resolution” but this resolution doesn’t help this system to go to DRUG sounding direction. At the end comparision of sound to cars is just irrelevant, because you use different cars for different purposes. But you don’t use sound for different purposes if you are serious about sound. Thanks for clarifying. And no worries, your English is no worse than the average American’s. We also ignore mild bass problems until the midrange is where we want it. You might want to try quality vibration control racks and amps stands someday which, we have found, not only eliminates many bass problems, but adds to the overall quality of the sound. We much prefer this approach to room treatments that detract from the often expensive and painstakingly designed aesthetics of many listening rooms. 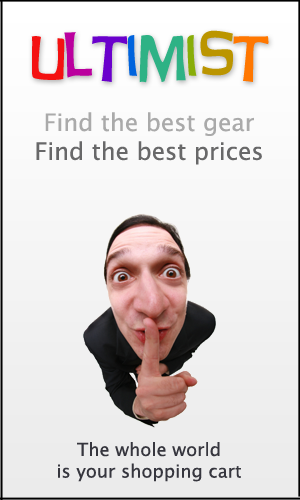 First, what you are hearing is your dCS. It is somewhat to the cold side of neutral, and you did not mention what cables you are using but if you have more resolution than the MAXX then we know your cables are at least letting through most of the music [which is great! and the only issue to look at would be whether the cables are shifting frequencies around by delaying some and not others]. Some people like the dCS sound, and many are fascinated by their technology, but you are obviously unhappy with the soulless nature of the sound you are currently getting. Cables we always try to keep more-or-less completely neutral, using the slight variances between cables to tune a system to taste. I will talk about a few recommendations – but feel free to email us if you want to go deeper into this discussion. I know Neli helps people design systems all over the world, usually only getting a cool new CD out of it [thanks Tech thanks Alex!]. 1. it is often best to make significant, but not wild, changes to your system and then to stop and re-evaluate where your systems is and where you want to take it next. 4. The only amps we would recommend without reservation are the Audio Note U.K. Gaku-On [this is after considering that most tube amps have no magic and little soul, and the rest will not be able to drive your speakers]. This would sound awesome [very dynamic, very colorful, very controlled] but would be a large change from your current system and I, currently, do not have a feel for where your preferences lie are on the Mind versus Heart spectrum [both can be soulful, IMHO, but my preferences are right smack in the middle, so what do I know? :-)] Anyway, this would be our second recommendation, probably keeping the dCS and then reevaluating where you want to take the system next. So we would recommend [and Neli and I came up with this idea before talking to each other about it], is to change the dCS to a Audio Note U.K. DAC 5 Signature and CDT4 or CDT5 transport. The DAC 5 Signature is $75K US, which we thought was completely ridiculous and nuts and stupid and a rip off … until we heard it here. Maybe I AM nuts and stupid but I want that thing BAD. Our system sounded better in my office down the hall i than it usually does in the sweet spot [ignoring the obvious absence of any sound stage etc in my office :-)]. With ourCDT3 it has a LOT of harmonics, very VERY pure harmonics, and the notes bloom very naturally, like the do on good LP playback and almost as much as they do in real life [you did not mention your analog setup, if any. This was another concern for us, that perhaps you do not like analog sound all that much and prefer a more neutral sound, but one with soul. So in some sense we are guessing that you are kind of average in your preferences here]. Most other tube sources sound really very veiled and flat and uneven. We are playing with the new Audio Aero LaSource tubed player (with pre). If you have easy access to one it might be interesting for you to try it. It will definitely make your system more musical and Enjoyable, but not sure about its Mind Expanding capabilities [we are doing a shootout tonight – in an hour in fact. Go to go!]. Hope this helps… or is at least entertaining! About comparing sound to cars. You are exactly right if everybody was serious about sound. The thing is, that many ‘audiophiles’ are not serious about sound. But they do not know it. We try to include these people in our discussions because, for one, their purchases drive a lot of the economic activity for high-end audio. Second, many are unhappy and they do not know why – hopefully some will read some of these posts realize that they unwittingly have bought a Boy Toy system [Corvette] but really want a DRUG sounding system [Porsche]. distinguish the sound of components. No it’s not the sound of dCS I hear, because when we change to MAXX “almost” all that bright, ultra clear, ringing and unattaching to lows mid range disappears. I say “almost” because with the MAXX also you hear solid-state-ish sound you perfectly wrote about. I must also mention treble, which is exaggerated and rather soulless but at least it is well connected to mid. Regarding “cars” I appreciate your honesty. No problem. The recommendations we made were applicable to many, many situations [though our first choice for an improvement of the Exquisite Midi system would be to replace the Vitus amp and pre with the Audio Note U.K. Ongaku [you out there Bob S.? Bob has this particular setup]. How old are the Exquisite Midi? They had some of the problems in bass integration you describe back in, I think, 2003 but they upgraded the bass drivers then and they have sounded quite integrated in the several different systems I have heard them in since. If these speakers are that old, you might encourage your friend to contact the factory and get that upgrade for the speakers. There is also a very recent ‘black label driver’ upgrade that we have heard does great things to the Ceramique 3.2 Kharmas but we have not heard the upgrade yet ourselves, so I do not have more information about its impact on, say, the Exquisite speakers. On the other hand, if they are newish, then perhaps they are not broken in yet, or need to be broken in again if they have sat unplayed for a long length of time [which would also explain the bright treble]? There are a lot of break-in CDs out there, and we use them but mostly we use ocean waves CDs, the sound of which does not drive us crazy, and we let it play all night every night for several weeks. I presume you are talking about the MAXX 3? The MAXX 2 had bass integration issues that were largely fixed in the 3, but I am curious because of the types of differences you are hearing in their treble region. It has been my experience that the Wilson treble has only *slightly* less resolution than the Kharmas. Finally, assuming your friend does not want to change electronic components [i..e stay with solid state] and you two still find the treble to be too hot for your tastes [after any upgrades and breaking in], you might want to consider changing the cables. The Kubala-Sosna cables were designed in large part when the owners were using and showing with the Kharmas a lot. They have a tendency to make the treble on the Kharms have a little less treble energy without sacrificing too much in the other frequencies. These also have good world-wide distribution, so hopefully you guys can experiment a little with these if you choose to go this route. We never had these problems with our Exquisite Mini speakers [with a very similar treble section like the Midi, if not identical], after they were broken in, and could run them with Nordost ODIN, Jorma Design PRIME – the very highest resolution cables, with NO brightness in the least. They ARE very high resolution [then again, so are the Wilsons] and some people DO prefer a less detailed presentation. I think Kharmas are 2007 or 2008 model and have more than 500 hours playing time, so it seems there is no issue about drivers. Cables are FadelArt Gold line coherence, and Wilsons tested were MAXX 1. Please pay attention I didn’t say sound of MAXX was perfect, I just said many of the problems I was hearing from Kharma disappeared. By recommending AudioNote you mean Vitus isn’t a good match? I myself think problem is more related to Kharma than Vitus, the problem is related to Kharma’s design. And by changing the amp we can’t get rid of the problems I mentioned. Though not related to this subject but I’m interested to know you opinion about CJ amps and pres. Where is their place comparing other amps in macro-micro chart. Re: Midi Exquisites. We’ve heard many, many Exquisite Midi systems and none of these nor the many more Exquisite Midi owners we correspond with are experiencing the problems you and your friend are. It is not hard to make a great product sound bad – and I have been making recommendations and asking questions based on the assumption that there is something anomalous with your setup. [beyond the coolness, lack of richness and to some extent micro-dynamics. The Audio Note recommendations were to address these aspects of your friend’s system sound. These amps have ‘soul’ and can actually drive the Kharma, and have many other positive effects which you can all discover and enjoy at your leisure]. So, two more things to investigate: Those cables are not known to me, but many cables do funny things to different frequencies. They could be doing something that the Kharma is sensitive to that the MAXX is not. Perhaps trying a different set of cables: even inferior cables … anything that is really different than your current cables, to see if the behavior changes. Also, speaker placement may be an issue. Usually one can just plop good speakers anywhere and they will work well to some degree. But some speaker-amp-room combinations are just more difficult than others. We opened 2 hours late one year at a show because our system was sounding very bright with a lot of sibilance [way worse than just bass integration issues… it was horrible] but we finally got the speakers a foot farther from the walls and toed in more so that 99% of the problem went away and it was ‘good enough’ for the first day of the show. Anyway, hope these help you track the problems. Kharmas aren’t perfect speakers either [no speaker is], but they are darn good and it would be great for you guys to hear what they can really do. Re: CJ. Depends on what you are trying to do with them and the system you are putting them into. Small tube amps are harder to classify than large tube amps and solid-state amps. They are very dependent on the efficiency and to a lesser extent the impedance profile of the speaker they are attached to. Small tubes amps vary quite a bit in how sensitive they are to the speaker’s profile: more expensive amps are sometimes less sensitive to the speaker being used, but not always. [Hmmm… if we include both lists: amp micro-dynamics and amp speaker requirements, perhaps we can all come up with something useful. OK. I’ll put it in the queue things we want to post about]. The quick answer is that CJ has more micro-dynamics than Cary which has more than Jolida, but less that the [I was going to say ARC, but I am not familiar with any of their stuff below 100 watts]… Pathos(?) less than Atma-Sphere less than Lamm / Audio Note. Not sure micro-dynamics is the key thing to talk about w/ respect to small tube amps? Comparing Lamm and Audio Note, for example, they almost have different KINDS of micro-dynamics. Perhaps rating them w/ respect to Heart and Mind (and Practical and Drug-like but not Boy Toy, no small amps in the Boy Toy category :-)) would be more useful, along with ability to drive a speaker and produce things that sound like notes. Gets the unnecessary negative loading out of the interpretation, and describes the *sound* these systems make. Good point re “impress me” being a subset of “move me” – at least for most audiophiles. Yes, calling these types of systems ‘Muscle systems’ removed the somewhat derogatory connotations that are associated with calling them ‘Boy Toy systems’. It is insulting to Muscle cars – muscle cars are by and large drivable and are more or less as useful as any other general purpose car [I drive an Audi S8]. These large ‘Boy Toy’ systems are not, I can argue, useful, by-and-large, for listening to music. Ask any spouse if they EVER use their spouse’s Boy Toy system [but some will definitely use their spouse’s Corvette, say, if their spouse will even let them :-)]. This is not the final word. People have responded much more to the Boy Toy label, perhaps because it is like someone blowing cigarette smoke in your face for years and years: it is one thing being tolerant, another when you are inundated with these kinds of systems everywhere you look. There seems to be a backlash effect. Oh, we played Janis Joplin’s ‘summertime’ off of Cheap Thrills, Big Brother and the Holding Company after our last shootout here. Was this the version you were referring to?